Football season is finally upon us, and with the first week of college football completed, the NFL season starts next weekend. So much excitement in the air as teams have a clean slate and are in control of their own destiny. 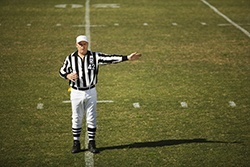 Along with every new season, comes a new emphasis on certain rules, and just like in any football league, from pop warner to the NFL, rules in the mortgage industry are always being reviewed and changed as well. It is mind boggling how many investors and products are being introduced into the mortgage ring. With QM, Alt-QM, HARP, I/O, and a slew of portfolio products, how can you keep it all straight? In football the rules are the same from stadium to stadium, this isn’t the case from Investor to Investor for your mortgage loans. With all of the changes and modifications to products you and your staff might offer, Marksman can ease your mind with all of the guidelines at your fingertips. Maybe you want to see which of your investors goes the lowest for FICO eligibility, or if I can offer a certain product in a state. All of these questions and more are answered within the Investor guidelines within Marksman. Don’t let any of the rule changes this season, or any season in your mortgage career surprise you. Review all of the investor specific guideline changes and updates directly from your Marksman account. If you have any questions or further clarification is needed, call up the replay official, or as we like to call them, your Account Managers.